We preach the Bible, the Divinely-inspired, infallible Word of God; from Genesis to Revelation, Jesus Christ, God the Son, the Way, the Truth and the Life! We welcome you to visit with us for worship and wonderful fellowship! Directions to our Church: Take Highway 88E to Cherry Hill from Mena, turn left on Polk Rd 70. 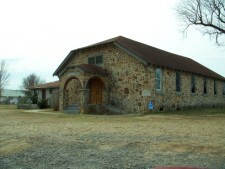 The church is located 1/4 mile on the left.